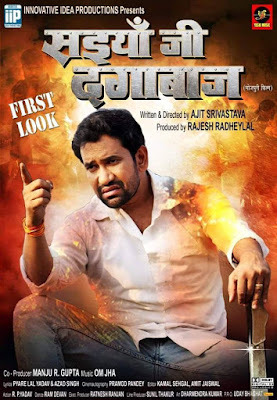 "Saiyan Jee Dagabaaz" is a Bhojpuri movie released on 12th April 2019. This movie directed by Ajit Srivastav and produced by Rajesh Radhe Lal. Lead roles are Nirahua, Anjana Singh, Sushil Singh, Anoop Arora, Manoj Tiger and others. Music compsed by Om Jha and lyrics penned by Pyare Lal Yadav "Kavi Jee" and Azad Singh.